For the marinade: In a medium glass bowl, mix together the onion, garlic, oil, lemon juice, vinegar, salt, and pepper, to taste. Add the fish and squash and marinate at room temperature, about 15 minutes. For the chimichurri sauce: Combine the basil, parsley, onion, garlic, red pepper flakes, salt and pepper, to taste, olive oil, lemon juice, and vinegar in a food processor bowl and pulse until the ingredients are just combined and chunky. Preheat the grill on high. For the fish skewers: Thread the marinated fish and squash onto the soaked skewers, 2 pieces of fish per skewer. Place one cherry tomato on the end of each skewer. Place on a well-oiled grill and cook until lightly charred on the outside and the fish is just cooked through, about 3 to 4 minutes per side. 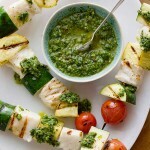 While the fish is still warm, drizzle with a little chimichurri sauce and serve more on the side for dipping.